David's contemporary and classic oil portraits not only convey a likeness of the subject, but his work captures the spirit and character of the individual subject. His unique ability to capture the personality of the sitter through local color, lighting and environment sets his work apart. David Beal began his professional painting career while still in his teens. As a young man he designed, illustrated and installed historical murals in public spaces, such as libraries and schools in the upper Midwest. He was recognized for his depictions of historical events through murals and figurative paintings at the age of 16 by President Gerald Ford. While still in high school, David developed the ability to quickly capture a realistic likeness of his subjects working in charcoal, pencil while refining his drawing technique and sensitivity to lighting and color theory. Mr. Beal furthered his art education by moving to New York at the age of 18 to attend the Art Students League of New York, in New York City. While in New York, David also attended classes at the Salmagundi Club and worked at the National Arts Gallery. He completed his formal education at the Columbus College of Art and Design in Columbus, Ohio, and the Kansas City Art Institute in Kansas City, Missouri. While attending the Art Students League in New York, David worked with renowned illustrator Robert Emil Schultz, anatomy and figure expert Robert Beverly Hale and pastel master Daniel Greene to refine his visual and technical skills specific to oil portraiture and pastel portraiture. David then worked professionally as an illustrator and Creative Director for many years, completing books, editorial illustrations, greeting cards, magazine covers, calendars, murals and other commissioned works of art. Mr, Beal has traveled extensively abroad, and recently returned from Tokyo, Japan, where he lived with his family for two years. His love for objects that tell cultural and historical stories manifests in his paintings. Unique textiles, cultural artifacts and other details are often included in portraits as ways to help represent individual personality and character. 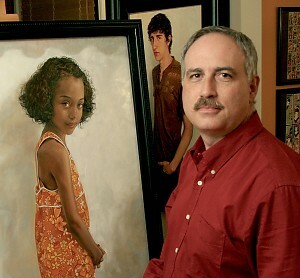 David maintains a studio in Overland Park, Kansas. He and his wife Carol, a jewelry designer, live nearby with their three sons. David has completed commissioned portrait paintings for clients across the U.S, from Cleveland to Kansas City to Los Angeles. He is a member of the Oil Painters of America (OPA) as well as the Portrait Society of America (PSA).